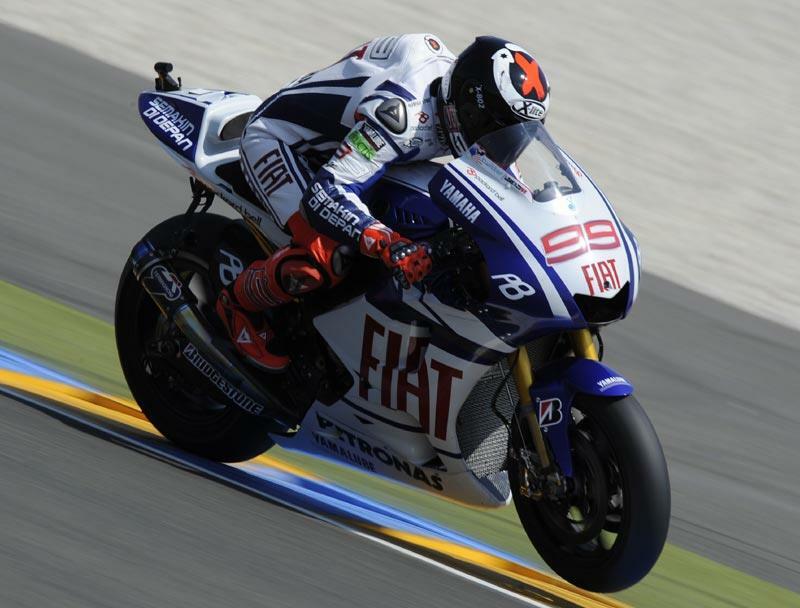 Jorge Lorenzo strengthened his early 2010 MotoGP world title bid with a crushing victory at Le Mans this afternoon. The Spaniard romped to his second successive triumph at the iconic French venue having streaked away from Fiat Yamaha team-mate Valentino Rossi with ease shortly before the halfway stage of the 28-lap race. Lorenzo was happy to stalk Rossi for the opening 12 laps after the Italian had made a stunning start from pole position. Lorenzo, who also won the recent Spanish GP in Jerez, did momentarily lead going into the first chicane on lap eight. But 31-year-old Rossi mounted an immediate counter attack and regained the lead. But Rossi’s fears that his damaged right shoulder would suffer after ten to 12 laps came true as he suddenly dropped off the pace once Lorenzo made his move on the 12th lap. The 23-year attacked again at the first chicane and within two laps he’d managed to open up a 0.640s lead on reigning world champion Rossi. Signs that Rossi was struggling with the shoulder he damaged in a motocross training accident last month were obvious on lap 15 when he suddenly slipped 1.505s behind his team-mate. And on lap 16 Lorenzo was able to extend his lead by another 1.6s as Rossi faded quickly to a distant second. Lorenzo was left to cruise to the 28th victory of his career and crucially opened up his early championship lead to nine-points over Rossi. Rossi was 5.672s back but able to ride to a relatively comfortable second place with Repsol Honda duo Dani Pedrosa and Andrea Dovizioso unable to challenge him. Pedrosa was right in the battle for the lead in the early exchanges before he dropped back into the clutches of Italian team-mate Dovizioso. Spaniard Pedrosa managed to resist intense pressure from Dovizioso until the final lap when the former world 125GP champion attacked at the first chicane. Pedrosa then ran wide trying to retaliate at the Musee right-hander to give Nicky Hayden a sniff of his third successive fourth place in 2010. And Pedrosa made another blunder on the brakes in the final section to let Hayden through. Marco Melandri rounded out the top six with a fine performance riding his Gresini Honda rider on Showa suspension for the first time since last November. Big shock of the day was another early crash from Australian rider Casey Stoner. The 24-year-old is already facing a massive mountain to climb to win his first world title since 2007 after he lost the front of his factory Ducati on lap three while he was in fourth place at the Garage Vert right-hander. His second crash in the opening three races has already cut Stoner a massive 59-points adrift of series leader Lorenzo and he is only 13th in the overall standings. Stoner looked stunned in the Ducati garage as he tried to come to terms with the latest crash. American Ben Spies had a nightmare weekend. Struggling with a badly swollen left foot after a huge practice crash yesterday, the Texan crashed out on lap seven while holding 11th place for his second successive non-finish.